This is a follow up on two previous posts on lateral thinking. 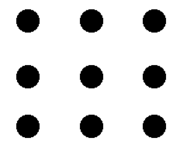 When the subject of lateral thinking pops up in conversation, odds are there will be someone who will ask for a pen and paper and go through the 9 Dots puzzle to relieve you of your ignorance. I’m still not sure whether this puzzle attempts to define lateral thinking or if it is a test to determine whether you are a lateral thinker. Maybe a bit of both and a bit of none. I hate it when someone pushes a puzzle under my nose and says “If you cannot solve this in 10 seconds, your intellect is suspect”. I withdraw immediately and usually get zero for the effort. Similar to working on a PC, and you have a person looking over your shoulder telling you what to do. Meanwhile you now exactly what you are doing, and can do it much better than the spectator. Anyhow, back to the 9 Dots puzzle. 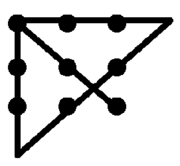 The puzzle consists of 3 x 3 dots, arranged in a square or box. What you are asked to do is to connect the dots by drawing four straight, continuous lines without lifting the pen. This puzzle is easily solved but only if you draw the lines outside the boundaries set but the 9 dots that form the “box”. So, you solve the problem by drawing lines “outside” the box, therefore “thinking outside the box”. The concept of the puzzle is much older. The puzzle was published in 1914, “Cyclopedia of Puzzles”, but the dots were eggs. There are further references to Chinese origins hundreds of years ago. My experience of lateral thinkers are those people who approach a problem with an enquiring mind. One will often hear statements like “what will happen if…. ?”, “how does this…. ?”, “When does this….?”. I don’t believe it is of necessity a function of intelligence, but more of an understanding of the topic in question. If lateral thinking is reserved for the intelligent, what is the measure? Mensa? Cannot be… If that is the measure there would be very few lateral thinkers. A high level of education and intelligence will enable an enquiring mind to solve complicated issues that a lesser educated or intelligent is unable to grasp. But, but it is often the “uneducated” person who has brilliant insights, as a direct result of not suffering from the constraints of a formal “in the box” education.